Abraham asks his servant to go down to the city of Nahor and find Isaac a wife. He makes him swear that he will not bring back a Canaanite woman. Apparently this was the way that people made vows and swore things to one another in the times of the Bible. I think nowadays we would be much more likely to do so over an ice cold beer and a hearty meal! Preheat oven to 375 degrees. In a large bowl place all the chicken. Pour Silan and Dijon mustard over chicken, rub into the thighs. Sprinke with paprika, cornstarch, salt, pepper, and garlic, rub to distribute evenly. Pour beer over the chicken. Let marinate for half an hour. Peel potatoes and slice into 1/4 inch rounds. Slice onion. 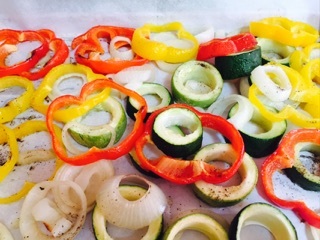 Drizzle olive oil on the bottom of the skillet or baking dish. Place onion on the bottom of the skillet (or baking dish), then add potatoes. Put chicken, skin side down, on the potatoes. 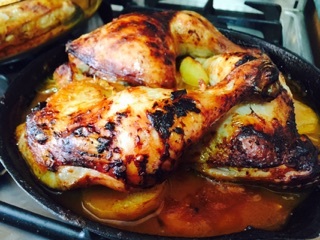 Put the cast-iron skillet or baking dish in the oven and cook for 30 minutes. 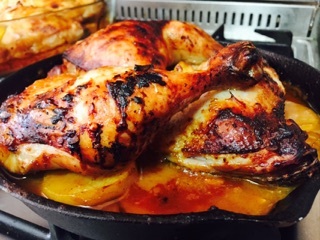 Flip chicken so that it’s skin-side up and then bake for 30 minutes more. For the last 5 minutes of baking, turn the oven temperature up and bit and let the skin crisp until it’s slightly and crispy and looks caramelized. Eliezer gave Rebecca gifts of bracelets and a nose ring, but he brought out all the stops when he went to go meet her family. He presented them with jewels, with silver and gold, with clothing and fabric, and all manner of precious things. What could be more precious than Beluga Black Lentils? 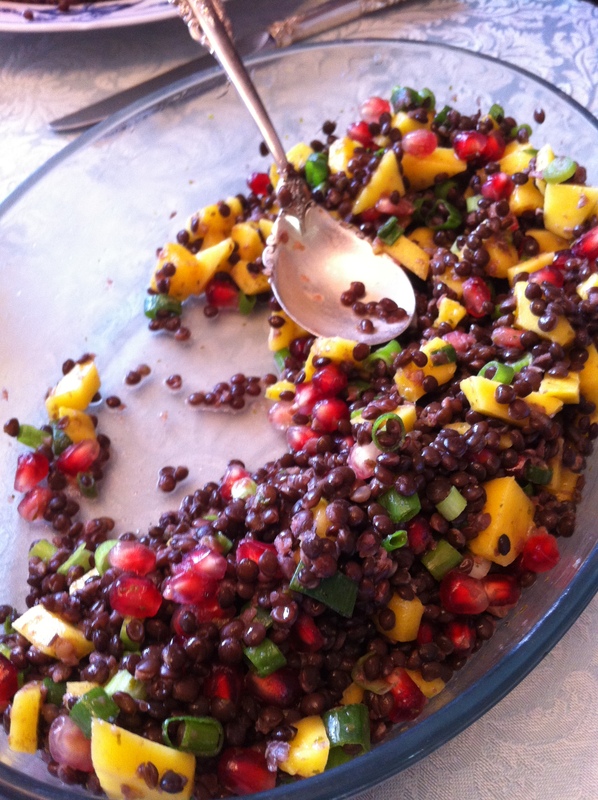 Garnished with jewels of pomegranate and mango, and dressed with a sweet and salty lemon-mint dressing. Cook lentils with water and 1 tsp salt for about 30 minutes or until lentils are soft (they should still hold their shape though and be somewhat firm). Drain and rinse lentils in a colander or sieve. 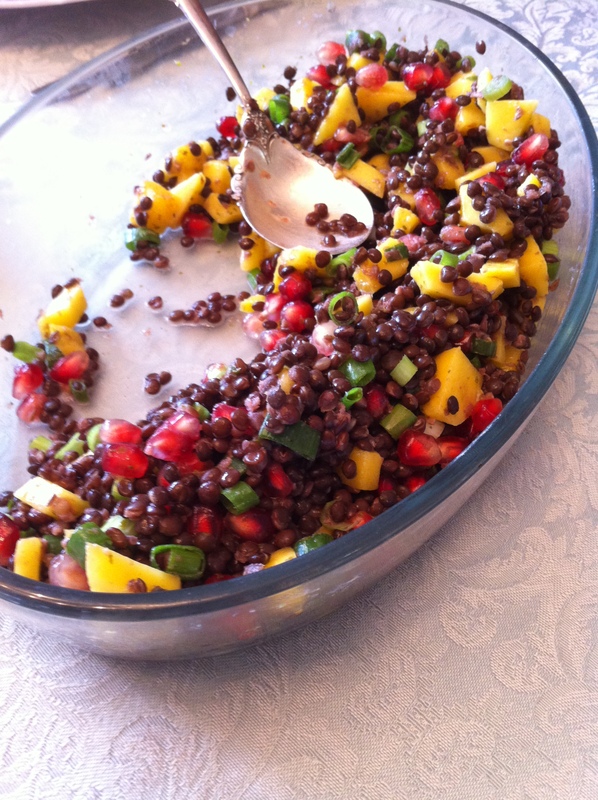 Mix lentils with pomegranate seeds, diced mango and scallion. Mix dressing ingredients in a long/tall container and then puree with an immersion blender. Pour dressing on top of salad. Garnish salad with toasted spiced sunflower seeds and fresh mint leaves. This dish should be served warm. Abraham’s servant Eliezer is sent to find a wife for Isaac. He asks God to help him, to send him some kind of sign, he wants the first girl that comes down to the well and gives both him and his camels to drink to be the right one for Isaac. Rebecca comes down to the well – and not only does she give water to Eliezer and his camels, but she gives the camels first, showing kindness to animals. Dice the onion and garlic and saute in the soup put together with 2 Tbsp. olive oil. Cook on a low temperature and let brown. 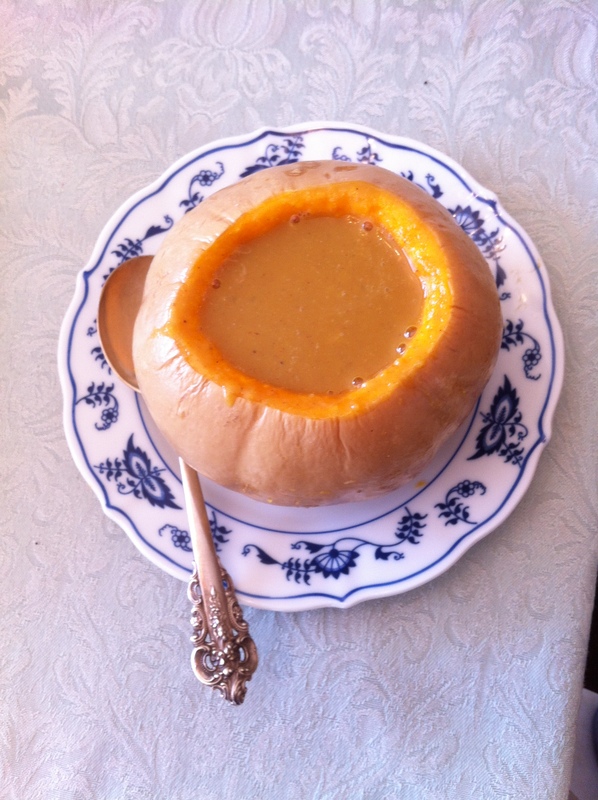 Cut the long tops off the of the acorn squash, peel and cut into large chunks and add to the soup pot. Peel and dice the apples and add to the soup pot. Add all the spices to the vegetables in the pot and mix well, allow to cook for 3-5 more minutes. Add 5-6 cups of vegetable or chicken stock. Allow to cook for 30-45 minutes. 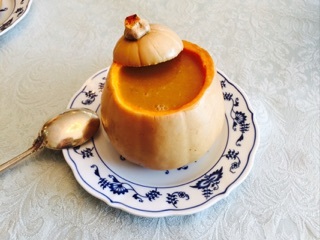 Hollow out the bottoms of the acorn squash, adding any extra squash to the soup pot, dispose of all the seeds and scrape the inside of each sqaush bottom with a spoon to clean it of all strings. Rub 1 tsp olive oil on the outside of each squash bottom and rub 1 tsp maple syrup on the inside of each squash. Place in oven and bake for 30 minutes. 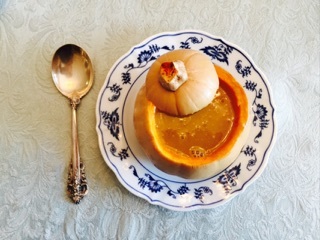 Taste soup and adjust seasonings to taste. Add coconut milk just before serving. Garnish with toasted spiced sunflower seeds and coconut cream. 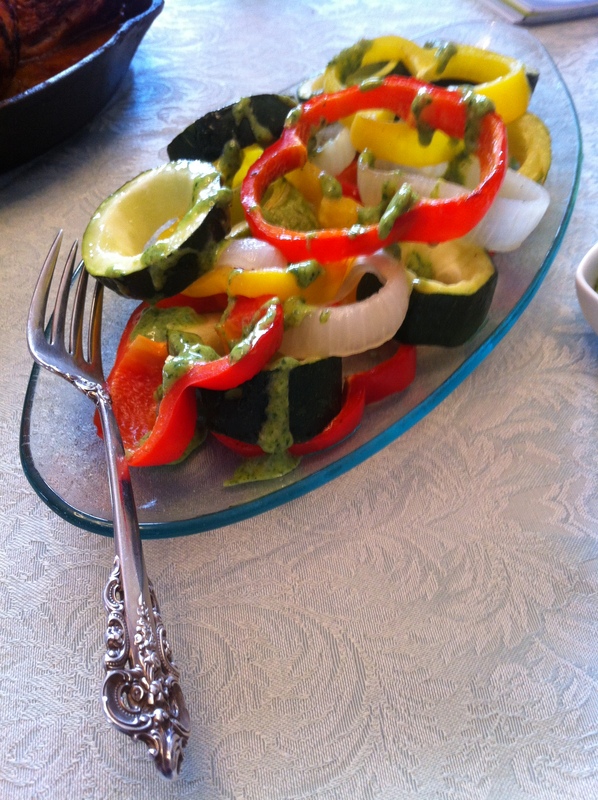 Joseph’s Technicolor Salad featured on The Forward! 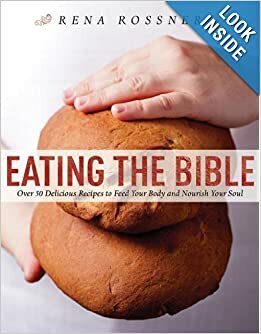 My recipe: Joseph’s Technicolor Salad from the Eating the Bible cookbook was featured on THE FORWARD by The Jew and the Carrot! Questions: Why do you think it is a blessing to increase like the fish of the sea? Why are the children of Israel compared to fish? Why do you think that we sing this song to little children? Who is the angel that is mentioned in the verse? Ideas: Fish! 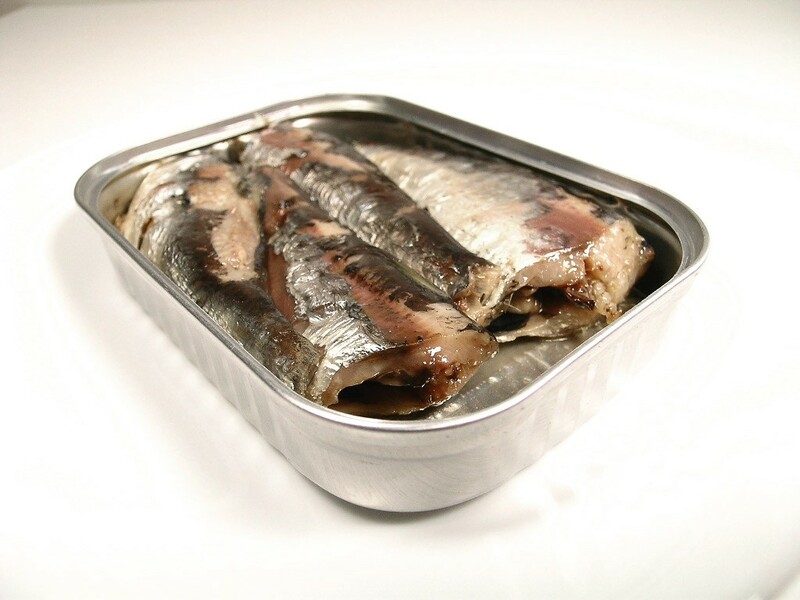 Gefilte fish, sardines, tuna quiche, salmon concealed in puff pastry or phyllo dough, Angel Food Cake. Set your table with hamsas, scatter turquoise beads and eye charms or tie napkins with red string. Questions: Why do you think that Joseph sent wagons to his father instead of going himself? Why do you think that Jacob’s spirit was revived at the sight of the wagons? 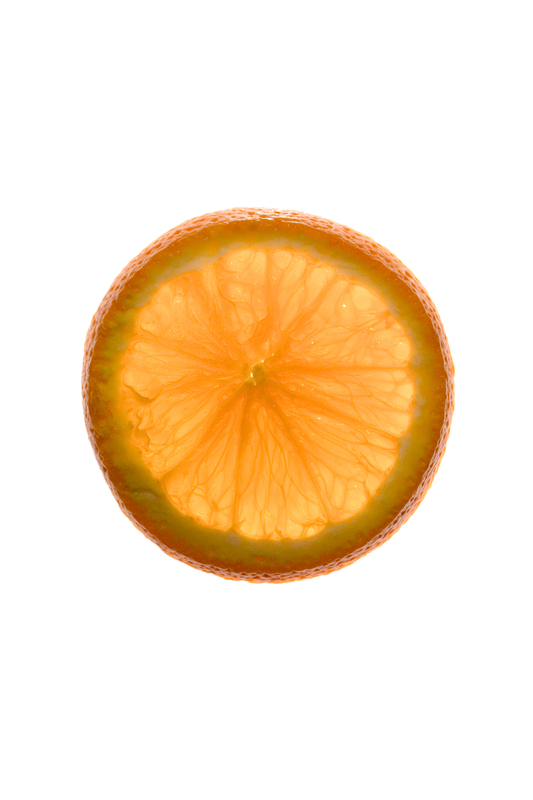 Ideas: Arrange slices of citrus, avocado, red pepper or other vegetables on a plate in the shape of a wagon wheel. Make little wagons out of celery, carrots, peanut butter and raisins (cut a small section of celery, fill with peanut butter, use two round carrot slices for wheels and decorate with raisins). Serve round cookies for dessert, and don’t forget some good-quality aged wine!